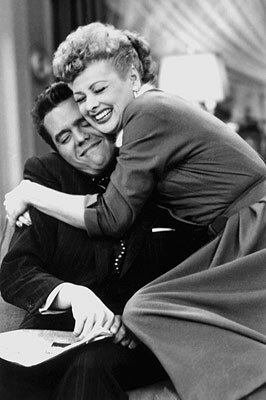 In many couples, of whatever age, one person’s the Lucy and the other person is the Ricky. One person is the Homer, and the other person is the Marge. One person is Han Solo, and the other person is Princess Leia. One person acts young, in other words: wacky, fun-loving, charmingly irresponsible. And the other person gets stuck with acting old. How do you become the Ricky in your relationship? Here’s how it starts: You want to take care of your Lucy. S/he makes you feel so important, so intelligent, so capable. And then, as time goes on, someone’s got to pay the bills. Organize the taxes. Discipline the children. Excuse me a sec: WOULD YOU PUT AWAY THAT ICE CREAM BEFORE THERE ARE ANTS ALL OVER THE COUNTER? Phew, where was I? Oh right: The next thing you know, you’re the Ricky. You’re yelling and screaming and cursing and threatening. You’re managing the money and blowing your top when the credit card is overlimit and the cell phone minutes are through the roof. Meanwhile, your Lucy, your Homer, your Han is wandering around in a daze, buying yellow shoes and auditioning for Broadway shows and befriending Wookies. So tell me, who do you want to be, the screaming check-writer or the starry-eyed golden-footed Wookie-lover? I rest my heavy case.